That’s one of the reasons that the Psalmist’s understanding of God as midwife so delights me. People who choose to make their life's work caring for women and the life coming into being through them aren't generally afraid of the mess. Nor of the unpredictability of the process. And so in the messiest and most dangerous moments in his life, the Psalmist cries out to the divine Midwife. In Psalm 71:6, when the Psalmist’s life is threatened by enemies, he prays, “It was you who took me from my mother’s womb.” The Hebrew text reads, "It was you who cut me from my mother's womb," picturing God as the midwife cutting the psalmist’s umbilical cord at his birth. In another of the most painful times of his life, when his sense of being abandoned by God was accompanied by physical illness and exhaustion and desertion by friends, David finds hope in the reminder that the same God who was present at his physical birth, guarding his life, still tends him: “Yet it was you who took me from the womb. You kept me safe on my mother’s breast” (Ps 22:9) The Hebrew literally says, "Yet it was you who pulled me out of the womb. 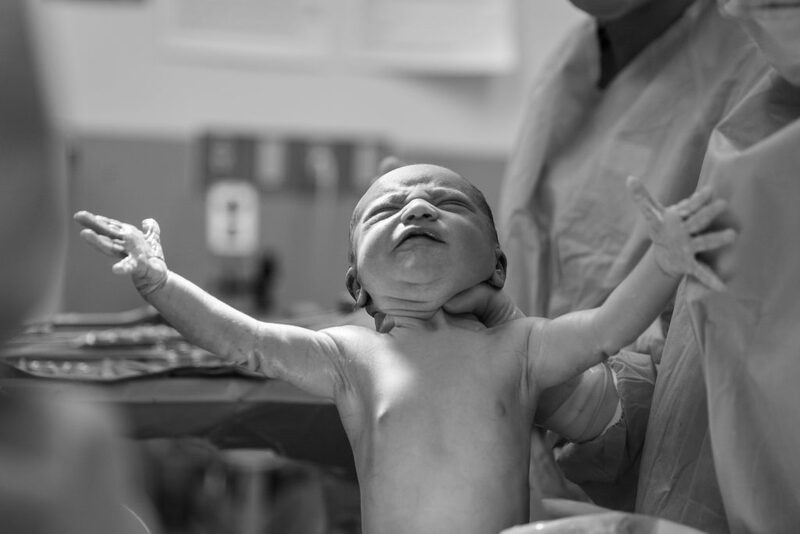 . . ,” picturing a midwife helping a baby be born. I'm intrigued that David and likely Jesus as well (both men!) found comfort in the image of God as Midwife. In Galatians 4:19, the apostle Paul addresses the recipients of his letter, “My little children, for whom I am again in the pain of childbirth until Christ is formed in you . . .” He paints a startling picture in which all Christian believers (women and men!) are pregnant and Christ is the baby growing inside of us. It’s an incredible privilege to carry Jesus within us. But I also know from my experience as an obstetrician walking with women through their pregnancies that as much as they might love the child being formed within them, pregnancy can be frightening. Spiritual pregnancy—Christ being formed in me—can feel scary and out of my control too—particularly knowing that this One being formed in me isn’t afraid of calling me to come and die on my way into new life. When fear rises, or I'm aware of my messiness, there’s comfort in knowing I’m in good hands, being cared for by the same skilled Midwife who was there at my own birth, unseen but present and wise and tender. That midwife is still guarding my life and skillfully working to safely deliver the life that is coming into being in and through me. Is there anything you'd like to say to your divine Midwife right now? Wow! Sounds like quite the experience, Janna. I’m so glad God was there looking after you and that you both survived! This is tremendous! I am a blogger and this is just beautiful! Someone sent this to me when they read what I wrote on Sunday. I would ask your permission to share it on my FB group. Thank you for hearing God’s heartbeat for each of us! Thanks, Esther. I’m glad you found it helpful. You’re most welcome to share any posts you find here. Hmmm! So good and challenging. The line “this One being formed in me isn’t afraid of calling me to come and die on my way into new life” is the part that scares me! I love the idea that Christ is being formed in me but I do indeed feel a bit apprehensive at times. To think about His/Her hands holding me I feel a bit unworthy is the first thing that came to my mind. I don’t always behave in the best way I should, and I certainly don’t understand all that is going on in my relationships and especially in Sudan right now. I want Christ to be formed in me but not of my own doing or efforts because that just sounds tiring and like it won’t get me very far. I would like some guidance as to what to expect from the midwife, what’s coming next. Perhaps sometimes though if I knew what was coming I’d be scared but some encouragement would certainly help. Thank you Carolyn for this and for helping us in this process, it strikes me that you are being a bit like a midwife to all of us. Mwah! Thanks for these thoughts, Bonita. That part of being called to come and die often scares me too. I think that’s a normal part of being human. It encourages me to remember that even Jesus agonized over heading to the cross. We are not meant to want to die! I think feeling unworthy is also a healthy part of the process. We ARE unworthy. But we are also loved and wanted and cherished more deeply than we can imagine. In a way feeling our unworthiness is part of what opens us up to receiving the gift of his love and grace. Until we really know we’re unworthy and not able to make ourselves worthy, we keep trying to prove that we’re loveable. Only once we accept that we’re not worthy are we free enough to receive love that is freely given, not earned. And then our focus can shift to the beauty of the love rather than our own unworthiness. Does that make sense? Also, I can identify with the desire to know what’s coming next, and yet the awareness that if I knew what was coming I might be scared. For me that desire to know what’s coming next seems to arise from a desire to control the journey, which short-circuits trust and the growth that needs to take place in me. I’m slowly recognizing that it’s a good thing that God doesn’t usually show me too many steps down the road, just the next right step. He is also wise and kind, and when he knows it really would be helpful for me to see a little further ahead, he will give me a heads up about what’s coming. Thanks, Mom. Yes, I’m grateful too!